The MKi system is a unique range of Bluetooth hands-free car kits which installs in every car. It combines the latest communication technologies with a full set of services dedicated to music. Once paired with your Bluetooth mobile phone, the MKi enables you to establish in a few seconds any phone conversations in your vehicle without needing to handle the telephone, even leaving it in your pocket. Connection with your mobile is made in a completely transparent way. The user-independent voice recognition and voice synthesis are now integrated in all MKi car kits, which dramatically eases the way of using them in every situation. All the connectors for any type of music device are provided with each MKi hands-free kit: iPod, iPhone, iTouch, USB sticks, USB MP3 players, Bluetooth Stereo devices, CD players, MiniDisc etc etc etc…. The MKi kits are delivered with a music cable specifically designed to adapt to any sort of digital and analogue music players: iPod/ iPhone connector, a USB connector to plug any USB MP3 player and a Line-In input for analogue sources. MKi also connects to any Bluetooth Stereo (A2DP) source: MP3 player, music phone, smartphones, PDA’s. The screen of the MKi9200 also features a SD connector to easily access up to 32GB of music! The remote control gives you access to the main functions: PLAY, PAUSE, NEXT SONG, PREVIOUS SONG, and VOLUME. MKi9100 and MKi9200 display the playlist for you to always visualize what is played. All music files are played back on the car’s speakers (front and back) while the MKi built-in digital amplifier transforms your car into a true concert hall! The MKi automatically synchronizes the names and phone numbers in your mobile with their phonebooks and update their phonebooks each time a new entry is detected. To access your phonebook and make a call, simply press the green button to start the user-independent voice recognition: the MKi 9200 recognizes your voice and the name you are saying without any prior teaching process. You can also directly access the phonebook and browse all the names thanks to the voice synthesis (Text To Speech). So simple! When you receive a call, the name and the number are displayed on the screen (9100 & 9200 only). To follow on your conversation in a discrete mode, switch instantaneously the communication towards your Bluetooth headset or your mobile phone. Wide compatibility and perfect integration. The software of the MKi range is upgradeable for free at any time from Parrots web site via USB. 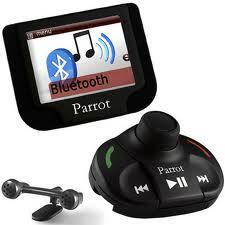 The Bluetooth wireless technology enables voice and data to be sent via a shortdistance radio link. It connects a wide range of electronic equipment without requiring additional cables. Furthermore, it extends the communication possibilities for mobile phones and a large number of devices. The Bluetooth stereo (A2DP) profile uses the same radio frequencies and can be used to send music tracks from one device to another. Please note, fitting is not included unless stated in the description above.